I have a bill to field in invoicing, I added the bill to field to my custom invoice, the bill to box prints, but, no data prints. Yes, while creating the invoice, I put in a customer name. Please help, I need it to print on my custom invoice. Go to Customers across the top. From there, select the New Customer & Job drop-down in the upper left-hand corner, and click New Customer. Enter in all of the information you'd like to see for this customer in QuickBooks. Click OK once you're finished. Note: you will see this customer's name appear on the list to the left of the Customer Center. Because you're new to QuickBooks, I imagine you will need to enter vendors at some point. You can follow these same steps for entering vendors under the Vendor tab across the top. Also, since you mentioned adding the field to the custom invoice by going into the template, I want to give you some information on custom fields and customizing forms. Custom fields give you the flexibility to add specific information to your customer, vendor, and employee list. It helps you add and track additional data about Items. The customized information can be included in your forms and reports. From QuickBooks Lists menu, select Templates and double-click the template you want to customize. In the transaction form, go to the Formatting tab and select Manage Templates. 1.) Manage Templates: When you select this button, you’ll get to the screen where you can view the list of templates for a specific form. Here you can Copy, Delete or Download Templates. If you need to rename your template so you can easily distinguish and use it, you can also do that task on this window. 2.) Add your logo: Select the box Use logo if you want your company logo to appear on your invoices and other forms. If you have not previously used a logo, a window opens where you can select a logo. If you have been using a logo and want to change it, choose the Select Logo button to select the image you want to use. 3.) Change fonts and colors: This section allows you to personalize fonts and colors for certain details (Company Name, Labels, Data, etc.) used in the form. 4.) In the Company & Transaction Information area, you can select the contact information you want to appear on the invoice. You can also change any of this information by clicking Update Information. When you add information, you need to select Layout Designer to move the information where you want is displayed. 5.) Additional Customization: Select this button to get to the screen where you can remove/add information on the header, columns, and footer of the form as they appear on your screen and the printed copy. Select the Screen checkbox if you want to see the field on your computer screen while filling out the form in QuickBooks and select the Print checkbox if you want the field to appear on the printed form. Note that you can assign a unique title for each header, column or footer. You can also set printing options (Print orientation, etc…) by going to the Print tab. 6.) Layout Designer: You need to go to the Layout designer especially if you opt to add or remove header/columns from the template. The layout designer allows you to move and resize items and information on your template. 7. )Print Preview: The right side of the screen gives you a quick preview of the template and the changes you have made thus far. When you choose the Print Preview button, you’ll see how your form will look like once printed. 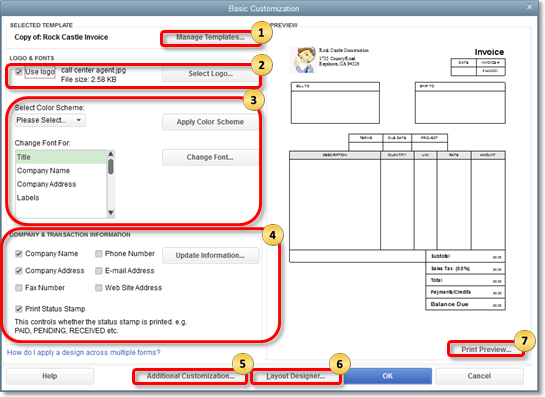 For more information and tips on how to customize templates, see: Use and customize form templates. And, to ensure you have everything you need for getting familiar with the Desktop version, take a look at this link here. This will take you to a resource center which outlines important topics form installing, to after you install, and if you run into issues early on. By entering your customers into QuickBooks this way, you are ensuring that the "bill to" field will populate and print properly. Should you have additional questions about this, or anything else QuickBooks, feel free to reach back out to me. I'm always here to help. Welcome back to the Community, @pradervr. I have a few clarifying questions to ask you before I get started. The "bill to" field you added; was it created as an additional field for the line items or a separate box entirely? This could explain why no data is printing, even though you've entered information to the field. Also, by default, there is a "bill to" box which will automatically populate from the customer's profile. Go to File, then select Utilities > Rebuild Data. Go to File, then select Utilities > Verify Data. Should the Verify find an issue with your data, you will be prompted to Rebuild Now or View Errors. Select Close, then perform the steps below. For your reference, here is an article that can help you further with troubleshooting potential data corruption: Resolve data damage on your company file. Download and run the QuickBooks PDF Repair Tool. Once the tool completes, try printing your invoice again. Press the Windows key + R to open the RUN command. Right-click an empty area of the temp folder, and choose Properties. Ensure all usernames and groups showing on the Security tab have Full Control. Once the permissions have been set to Full Control, try printing the invoice again within QuickBooks. For your reference, here is an article with additional steps for troubleshooting this: Resolve Problems Printing. Also, if you're still having trouble with data not appearing when printing, you can try a clean uninstall and reinstall of the program. This process clears temporary files from your computer relating to Premier Desktop 2018, which could be causing info to not show or print properly. If you'd like to read more on this, follow this link here. When you have the chance, please take a look at how this "bill to" field was entered into QuickBooks. If you give the steps I've recommended a try, please be sure to keep me informed of any developments that may arise. Should you have any questions about this or anything else QuickBooks, don't hesitate to seek me out here in the Community. I'll be here on standby, awaiting your response. I added the field to the custom invoice by going into the template then clicking additional customization then making sure that the Bill To was checked for screen and print. I am new to quick books and this is the first time I have ever used it, had it for a month. Coming off of paper only---FYI. My customer data base is empty and I will be building it hopefully soon. While creating the invoice, I put the customer name into the bill too. "My customer data base is empty and I will be building it hopefully soon. While creating the invoice, I put the customer name into the bill too." When you make an invoice, top Left, choosing the name, the Database accesses this info for you, bringing it to the screen.